In 2006, Nalini Singh introduced the beguiling and sensual Psy/Changeling world in Slave to Sensation, which spawned a series that has had readers and critics cheering. Throughout the incredible eleven-book run there has been one question that has tantalized Nalini's legion of fans. 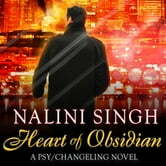 Now, in the eagerly awaited twelfth book in the series, Nalini Singh finally reveals the answer to the biggest Psy/Changeling mystery-an answer so surprising we wouldn't dare spoil it. Even if we knew.